I’ve always felt a bit negative about painting awards, believing that judging art work is very subjective and that you can probably have a good guess at what work any judge is likely to choose by looking at his (or her) own painting style. With regard to “People’s/ Viewer’s choice” voting, my feelings have been even more scathing with my perception being that with a quick wander around a show I could probably pick the work which would get the most votes. That work would probably be a bit cutesy and may include animals or children. 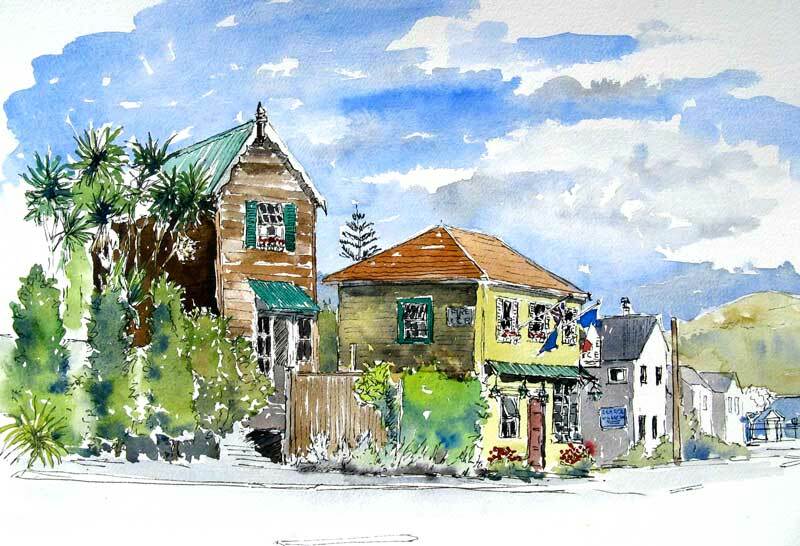 So I was staggered (and secretly pretty chuffed), last Thursday evening to receive the President’s Award at the Town and Country Society of Artists exhibition for the pen and watercolour work of an Akaroa street above. I quite liked the work which was completed quickly, and mostly on site although it has at least one perspective error. It has an immediate, lively feel but I have not rated it particularly highly, so you can imagine my surprise, when I went to pick up my work, at being told that it had won the People’s Choice Award too. I might have to review my prejudices! The paintings below are from my Holland Trip or are from the Culverden/Waiau area, these will be shown in a joint show at the Culverden Gallery starting on October 17 and running until November 4.